The Feds (god bless their pointy little heads) insist that you have a minimum of 40 hours of instrument training and 50 hours of PIC (Pilot in Command – more acronyms anyone?) cross country time in order for you to take your instrument rating practical exam. There is a knowledge exam that you’ll have to pass prior to the check ride, so accomplishing that sooner in the training is better than getting it done just before your ride. An instrument rating will make that private pilot certificate you so proudly achieved a lot more practical. There might come a time when you and your significant other planned a weekend cross country to, say, Monterey. You take off from work early on Friday afternoon eager to make the flight and discover that a marine layer of low clouds has settled over your home base, San Diego’s Montgomery Field. What can you do? Well, basically, nothing – certainly not fly your trip – unless you’ve got an instrument rating. 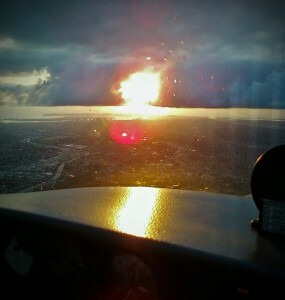 Breaking out of the clouds on the ILS 28R at MYF, just before sunset. An instrument rating doesn’t give you the skill to fly in any weather – there are some weather conditions that even highly-experienced instrument pilots will avoid: a thunderstorm, to name one. But an instrument rating enables you to fly when the weather keeps VFR pilots on the ground. It is a fun rating that requires a level of focus that most people are incapable of. But you’re a pilot and you’re the type of person who is motivated to succeed. An instrument rating is crucial to your ability to enjoy all the benefits that accrue to you as a pilot. The process begins with the first of four phases of training. You develop basic instrument skills that enable you to fly the airplane solely by reference to those little instruments in the panel in front of you. It’s amazing how a little movement on your attitude indicator relates to a significant movement to the airplane’s flight path. Controlling those movements requires a very subtle application of the controls and constant attention to monitoring all of those instruments. The second phase of the training involves combining your new found instrument skills with radio and GPS navigational devices. Once you can control the airplane solely by reference to your instruments, you need to learn to incorporate the navigation instruments into that skill set so that you can fly from navigational fix to navigational fix. It can be demanding, but, unlike the first phase which seems a tad pointless, you’re actually doing something worthwhile. 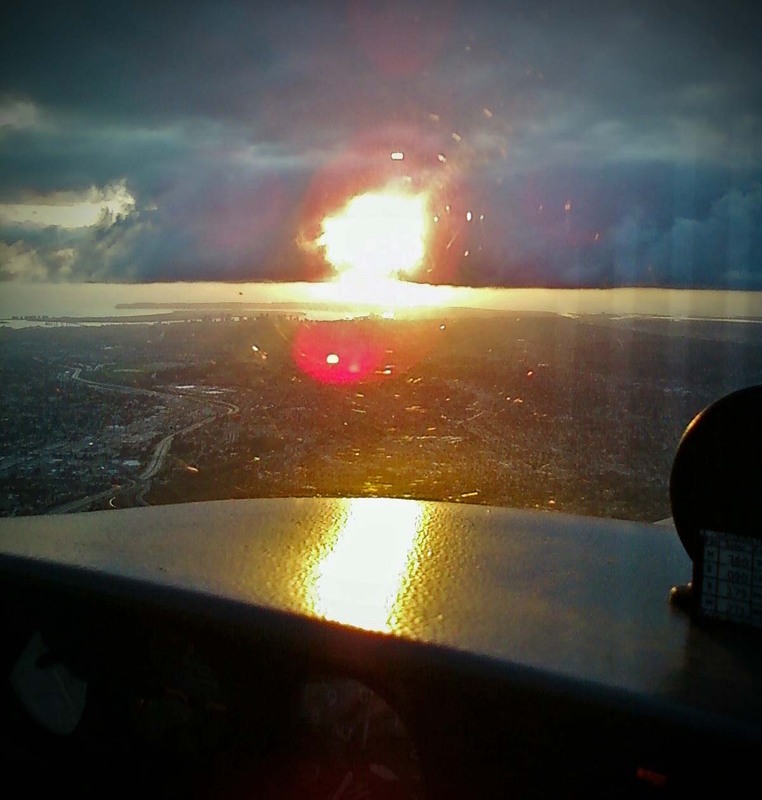 The third phase of your training is what it’s all about: flying instrument approaches. Once you’ve flown to your destination, you need to be able to fly down through the clouds to find, and land on, a runway. Instrument approaches are how you accomplish that feat – and this is where the skills you developed in the earlier training are tested. There are a bevy of different kinds of instrument approaches based on the navigational aids that control the approach. There are GPS approaches, sublimely precise ILS approaches, Localizer approaches, VOR, LDA, SDF and even lowly NDB approaches. You’ll need to be able to fly them all and demonstrate a skill level that a lot of people, even some pilots, find too demanding. BUT, when you can successfully navigate all of the approaches available to you, you have joined the crème de la crème of aviation. After the third phase of training, you’ll fly the only cross country required – and it’s a dual flight with your instructor. You’ll have to land at three different airports and fly three different types of instrument approaches in order to complete it successfully. Finally, the fourth phase of your training involves practicing for your instrument rating practical exam. There are certain maneuvers that you’ll be required to demonstrate, unusual attitudes from which you’ll have to recover, and at least three instrument approaches, one of which will be done partial panel: without the use, usually, of the vacuum instruments, the attitude and heading indicators. When you’re ready, once again your instructor will make an appointment with a DPE (remember the dreaded Designated Pilot Examiner you met for your private certificate?). The practical test will again involve a check of your qualifications (score well on your knowledge exam, please, and the oral will be a more pleasant experience) and answering questions all about instrument flight and the flight the examiner has asked you to plan. The really interesting thing about the oral is that in the ENORMOUS volume of regulations in the FAR (Federal Aviation Regulations – what, you thought there wouldn’t be any more acronyms? ), only seven pages are devoted to instrument flight. How hard is that? If you succeed in the oral, you’ll get to do the fun part, fly the flight test. You’ll perform the maneuvers required and you’ll fly three different types of instrument approaches. Perform to standards and you’ll become the newest instrument pilot on the planet. It was, for me, the hardest rating or certificate to accomplish – but it was the most satisfying. As a new instrument pilot, your skills are nearly the equal of anyone flying any airliner anywhere in the world. You won’t have that airline pilot’s experience – that might come with time – but you’ll have his or her skills. Once you achieve that instrument rating, most weather will simply become another opportunity to demonstrate what a superior being you’ve become. As with all things involving risk, you’ll need to ease into that new rating. The day after you pass your instrument ride, you won’t wanna go out and fly an ILS approach to minimums – 200 feet of ceiling and ½ mile of visibility is something you don’t want to attempt until you’ve got a bunch more experience. You might start your instrument flying career by limiting your personal minimums to, say, a ceiling of 1000 feet and visibility of 2 miles, for a start. Then, as you progress and fly approaches regularly, you can slowly lower your minimums. One more thought about your new instrument rating. More than almost anything you’ve ever done in life, you have to maintain those instrument skills by constant practice. After I got my instrument rating, I would fly approaches with a safety pilot on board at least every two weeks. The regulations require six approaches every six months. Don’t be a sucker and fly to the minimum requirements. Fly approaches regularly, maintain and expand your skills. You’re a pilot, you’re an achiever – your goal is to continue to improve your skills. Now, get out there and fly some approaches.